The area surrounding the project site at Kyekidde has a very high population density, and is near to Uganda’s second largest urban center, Jinja. Because of this, land holdings tend to be very small, with plots in the irrigated area often sized less than 200 square meters. Farmers rent land at prices far higher than other places in Uganda due to the strong demand for plots near the valley bottoms where streams pass. Farmers at this site have a long history of growing vegetables, especially in the valley bottoms. 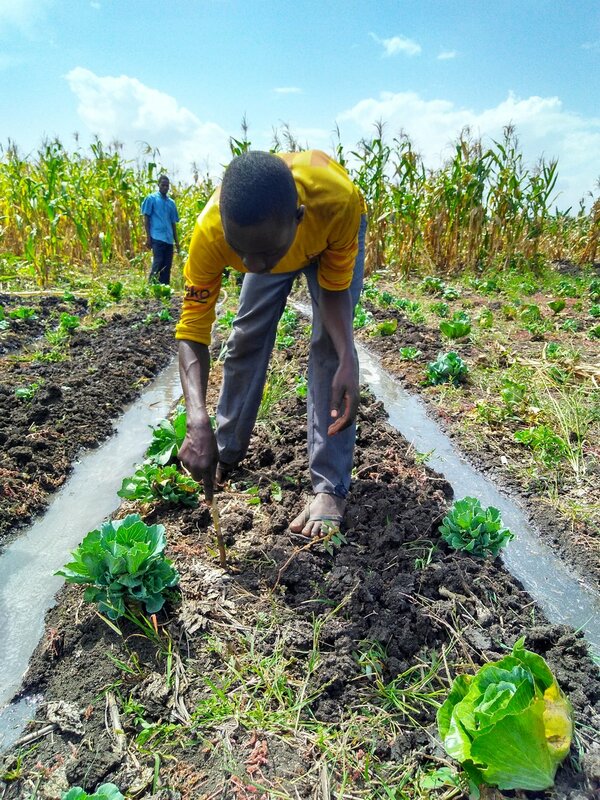 The project works with a farmer group at this site, Kyekidde Vegetable Farmers Association, which represents over 40 members, most of whom do some kind of irrigation. The traditional irrigation methods include carrying watering cans from the stream or using washbasins to throw water onto plots— both very physically demanding tasks. Kyekidde is located in the western Lake Victoria crescent, an area characterized by reliable seasonal rainfall from March to June and from September to December. The terrain is dominated by hills and valleys with moderate relief. Hilltops tend to be lateritic, midslopes are usually ferralsols / ultisols, acrisols, or nitisols rich in clay, and valleys tend to be alluvial or fluvic, also very rich in clay. Upland staple crops are mainly maize and beans, along with sweet potatoes, and a smaller extent of millet, groundnut, and cassava. Sugarcane is a major cash crop taking up large acreages, and robusta coffee is a smaller cash crop of diminishing importance. In valley bottoms, vegetable farming is important in local livelihoods despite its small acreage. A Kyekidde farmer checks the horizontal infiltration of water from the furrows into the bed where cabbages are planted. Originally, the farmers designed a single centralized irrigation area, downgradient of the water source, where plots could be leased from a single landowner. Concerns about access and rental costs of plots led to a redesign, creating instead a decentralized system consisting of five irrigation areas spread throughout the valley, each serving a subgroup of farmers with adjacent plots. Separate main lines bring water from the stream to each area, and members have selected different methods to apply water on their individual plots. Group members cooperated to organize a rotation of the one water pump among the five subgroups. This system allows most members, and especially women, who are not able to rent land near the original irrigated area to still access the benefits of group membership with their more distant plots. With heavily-used, shared equipment like water pumps, challenges emerged regarding proper care and maintenance and how to ensure every member had access to the equipment. This situation particularly affected women farmers with narrower time windows in which to work. To resolve this a technically-trained paid “pump operator” was elected by the committee and provided a small salary in exchange for maintaining the equipment and timely transport of the pump from one subgroup to the next. Members of the Kyekidde irrigation group work together to prep and start the pump, which draws water from the stream (at right) and sends it through another flexible pipe (at left) uphill to a set of micro-furrow-irrigated plots. Growing irrigated crops on mild- to moderately-sloped land presents challenges in achieving uniformity of water application, while preventing runoff and soil erosion. Micro-furrows allow Kyekidde farmers to extend their vegetable production from the flat valley bottoms up to surrounding shallow hillsides by conveying irrigation water to plots in enclosed furrows. Micro-furrows also provide a high water-use efficiency, and require little expense in purchased equipment. With many small adjacent plots owned by different group members, each farmer was carrying his or her own water in jerricans or basins from the nearest stream. This labor was essentially eliminated with construction of a manual pivot piping system consisting of a buried pipe that conveyed water from the stream to the center of the irrigated area. From there, a tap was extended to the surface. Members could now access water by tapping into this source with flexible piping to distribute water on their own plots. Kyekidde’s many small, irregularly-shaped plots, owned by different members, have different irrigation needs depending on the crop, growth stage, slope, and farmers’ time constraints. Conventional grid-layout sprinklers typically provide uniform application of water across a large radius at a low application rate, making them not very suitable for Kyekidde’s conditions. Our project worked with the farmers to develop a multiple-head sprinkler unit, which combines four high-impact, short-radius sprinkler heads that operate simultaneously and deliver a high volume of water to a small application area. The unit can be moved easily from plot to plot relatively rapidly, reducing time needed for irrigation and ensuring access to more farmers.